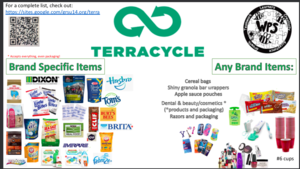 The Terracycle Club wanted to give a huge thanks to everyone who is helping fill up our buckets, putting buckets in their classrooms (and homes), and encouraging the important conversation about conservation. Please keep talking with your students (and friends) about this amazing program! I casually mentioned it last year to one of my doctors, and a few weeks ago when I went back he'd saved me a bag of terracyclable-trash! That’s more money for our school and less trash in landfills! Some very generous individuals have been donating brand new/unopened items to our bins, however, please remember we just want your garbage! We turn trash to cash, so please remind families that there is no need to send in new products, only the empty containers (and packaging when applicable). There has also been a bit of wish-cycling happening, so I wanted to send out this updated flyer as a reminder of what we do collect. 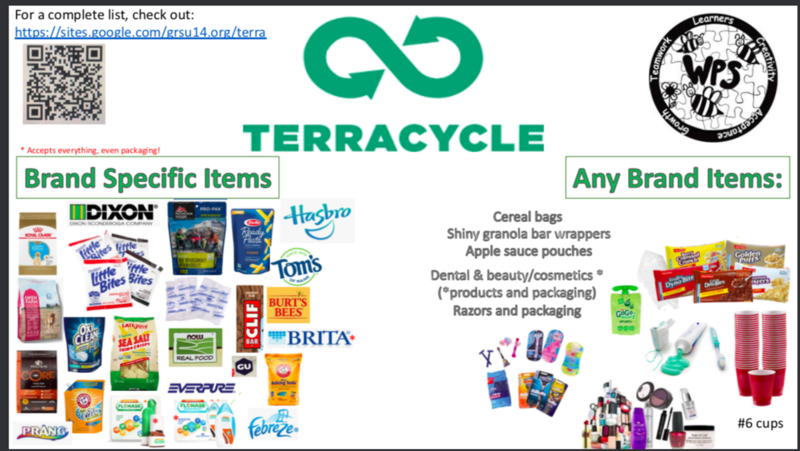 If you aren't sure if we can Terracycle something, feel free to ask or check out our own "What we Terracycle" page. It is updated with quick visual overviews of all our programs (some examples are below). -Bear Naked Granola is no longer accepting pouches, so we will no longer be collecting those. If you have any Bear Naked Granola packaging, please get it to us by the end of the week for our last shipment. - Keep those cereal bags, apple sauce pouches, and beauty/dental products coming! We should be making a shipment soon.